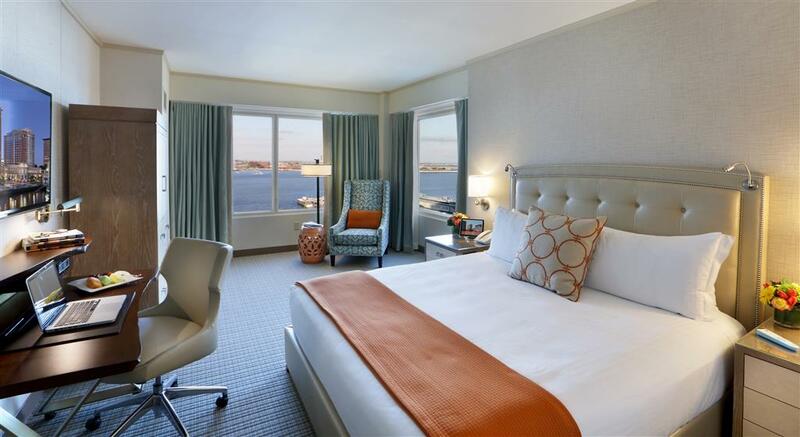 Located on the waterfront in the bustling Seaport District the AAA Four Diamond Seaport Boston Hotel offers luxurious accommodations with stunning city and harbor views and incredibly convenient access to all major points of interest. Seaport Boston Hotels gracious and accommodating staff provides unparalleled service and the hotels innovative amenities including complimentary wireless internet access service inclusive policy and complimentary use of Wave Health and Fitness are sure to delight. From 8/1/16 - 9/19/16 our pool will be undergoing renovation and will not be available for guest use. We will have pool access available at an area hotel. We apologize for any inconvenience. TAMO Bistro and Bar: Featuring contemporary cuisine with a distinctive Boston accent TAMO brings you the best that Boston has to offer with hand crafted cocktails and stylishly presented food inspired by Bostons famous ethnic neighborhoods the bounty of New England farms and the Atlantic Ocean at our doorstep. Aura restaurant: Aura is open daily for breakfast and is available for private events. Seaport Boston Hotel is situated conveniently along Bostons historic waterfront within easy walking distance of the Boston Childrens Museum Harpoon Brewery the Institute of Contemporary Art the New England Aquarium the Boston Convention and Exhibition Center and the historic Freedom Trail. Back Bay AmtrakAmtrak rail located in Boston Back Bay. Black Falcon Cruise TerminalcCruiseport Boston and Conley Terminal is New Englands Maritime Hub and port of call destination for several cruise lines. Blue Hills Bank PavilionOutdoor Amphitheater situated on Boston Harbor. Boston Childrens MuseumBostons Educational Museum for Children. Faneuil HallShopping and Dining Marketplace on Bostons Waterfront. Logan International AirportInternational Airport less than 3 miles from Hotel. New England AquariumAquarium located on Central Wharf in Boston and also home to Simons IMAX Theater and Whale Watching tours. South Station AmtrakAmtrak rail located 2 subway stops from Seaport Hotel. Spirit of Boston Provincetown FerryDocks for Boston Cruises and Bay State Cruise Company conveniently located adjacent to Seaport Hotel. Spirit Boston yacht for events and Provincetown Ferry fast transportation to Cape Cod. World Trade Center Silver LineSilver line T stop located directly behind the Seaport Hotel. Boston Beer CompanyBrewery of hand crafted beers including their flagship brand Samuel Adams. Boston Convention and Exhibition Center BCECThe BCEC is the largest exhibition center in New England. Boston Design Center Drydock AvenueOffice complex with dozens of luxury interior design show rooms in addition to unique office space for a wide range of startup companies. Cabot CorporationGlobal specialty chemicals and performance materials company HQ in Boston. Channel Center StreetCorporate neighborhood of Boston with new development including a brand new State Street Bank office building. EnernocEnergy Management and demand response solutions firm. Fidelity Investments HeadquartersMultinational financial services corporation HQ in Boston. Financial DistrictBostons financial institution headquarters. Harpoon BreweryAmerican Craft Brewery and Beer Hall. International PlaceBoston skyscraper located in the Financial District neighborhood. JP Morgan ChaseJP Morgan Financial offices located at 70 Fargo St Boston. Manulife FinancialCanada based financial services group. Marina Park Drive Fan PierBrand new office complex and neighborhood on Bostons waterfront. Moakley CourthouseJohn Joseph Moakley US Courthouse located on Fan Pier waterfront overlooking Boston Harbor. Pricewaterhouse CoopersProfessional Services network relocating offices to Seaport District in 2015. Procter and GambleConsumer products company also known as Gillette USA. Boston HQ at 1 Gillette Park. State Street BankInternational financial services holding company with offices in Channel Street area. Thomson ReutersMass media and information firm. Vertex Pharmaceuticals HeadquartersGlobal biotechnology company with brand new HQ located at Fan Pier in Boston. Wellington ManagementGlobal Markets investment management firm. ZipcarCar Sharing and Car Club Service.